This morning we woke to high winds and snow, which had been forecast for mid-week, but we were expecting another day or two of good weather in order to squeeze in a summit. With the bad weather arriving and another week of it predicted we turned back. We had rushed after our Broad Peak summit to try to catch this window but it looks like with simple bad luck on timing I missed the K2 window by two days. This particularly hurts as I felt ready for it, and we were going without supplemental oxygen, of course. Alas, the fickle Karakoram weather fooled us. This must be very disappointing for Fredrik as this was his third attempt and he was on K2 inn 2008 when 11 people died. Furtenbach Adventures still has a small team at K2 BC but there are no updates as to their plans. Red Bull, one of Andrzej Bargiel‘s sponsors posted a teaser video and a few images of his ski descent as he connected four routes on the descent: Abruzzi Rib, the Česen the Messner variant and the Kukuczka-Piotrowski routes. 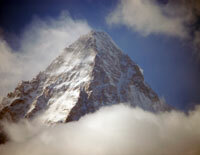 He summited Sunday, 22nd July at 11:30am and reached the Base Camp at around 7:30pm local time. By now, its well known that his brother, Bartek Bargiel, was using a DJI Mavic Pro drone to film the descent, and help rescue another climber on Broad Peak! I don’t what the video plans are but similar to Kilian Jornet’s double summit in a week of Everest last year, they will probably create a documentary. Did he use supplemental O2 to get to summit? Incredibly impressive feat either way. Just curious. I know that he has stated he’ll be back each season until he reaches the summit but you have to wonder if K2 is trying to tell Fredrik Strang something. fredrik should have focussed on k2 alone; i guess he wasted an opportunity by going to broad peak, prospects of double header undid k2 bit….